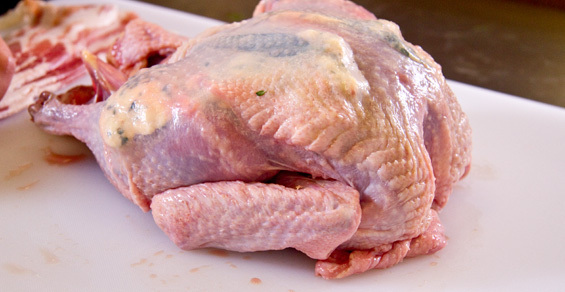 Trussing poultry and game birds promotes even browning by protecting the wing tips and legs from getting scorched. 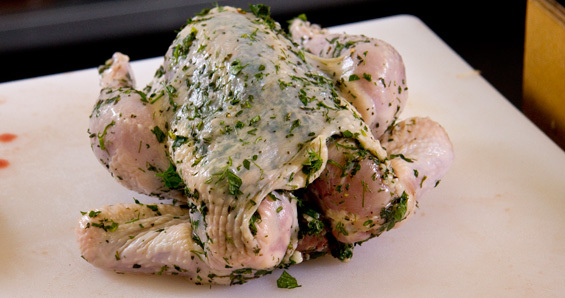 It also gives the bird a classic presentation that many people prefer. 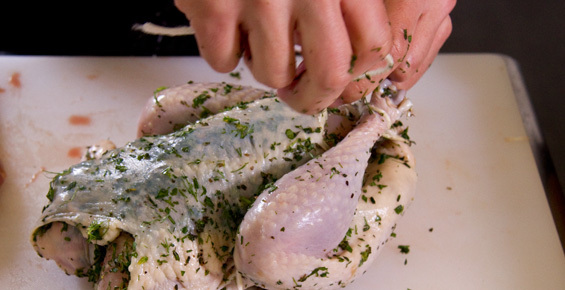 Tuck the tips of the wings under the chicken’s breast meat (to the back). Or, for a different look, Draw the tips under while extending the middle joint out – so the bird looks like it’s sticking its elbows out. Start your twine under the tail, loop it around the tail and tie it tight. Draw the ends of the twine up either side of the bird’s body to the front. Loop them around the wings to draw the tips closer to the wing base & secure them. Take the twine back along the body, this time over the legs. Loop each side of the twine around that side’s leg tip, then draw them together behind the bird and tie them tight to draw the legs in toward the body. 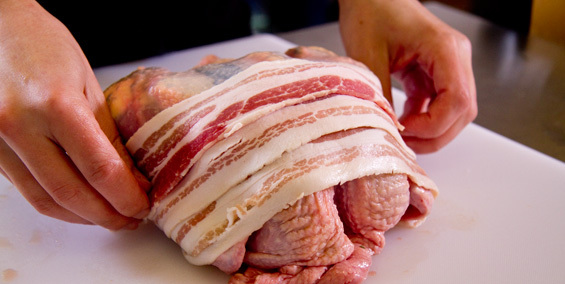 Barding (wrapping with bacon) helps keep the bird moist while roasting and adds additional flavor. 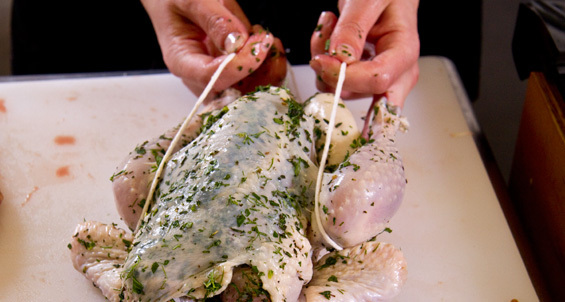 Trussing poultry that has been barded holds the bacon strips down securely. Use a significantly longer piece of twine as you’ll be making extra loops. 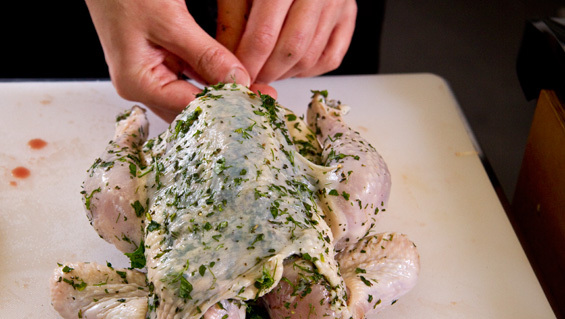 Tuck the wing tips under the breasts. 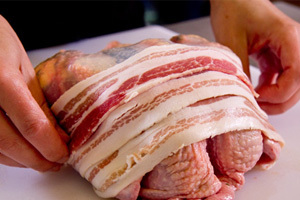 Lay the strips of bacon over the top of the bird to cover all the breast and leg meat. Loop the twine under the bird at the tips of the legs so that most of the twine is on one side. Tie both ends of the twine above the legs and pull the knot tight to bring the legs down close to the body. Draw the long end of the twine (extending from that knot) up the body to the lower breast section. 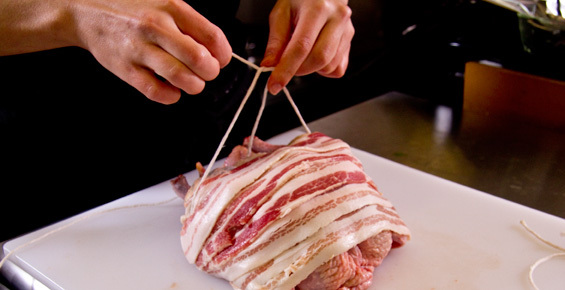 Loop under the bird and around, then tie again on top, tightening the knot to secure the bacon. Take the twine from that knot further up – to the mid breast – and loop, tighten and tie again. Optional: create another loop near the top of the bird if necessary for your bird & barding technique. Optional: Fresh herb sprigs can be inserted under one or more of the top loops before roasting to impart additional flavor. Discard them after the bird comes out of the oven.